This is one series that definitely gets more intense with each installment. The characters develop more layers and the closer they become to each other the higher the stakes become.I have to confess that I knew some of what was in store for me when I picked up My Soul to Keep. I’m later than most to this series and the longer a book is out the harder it is to keep from knowing at least a little about what happens – especially when those events bring out strong emotions. Yet, even though I knew that this one was going to be a heart breaker, I wasn’t prepared. Regardless of what happens next, because of the events that took place in My Soul to Keep, noting is ever going to be the same.As heart breaking as a lot of this book was and as mad as a few characters made me, there was still a lot to love about it. I was impressed most with Kaylee’s strength. She had a lot to face in My Soul to Keep and a lot of really tough decisions to make and I’m glad that she didn’t simply crumble. She wasn’t the only one surprised and impressed me. Todd is turning into one of my favorite characters and I totally didn’t see that coming. Turns out there’s a lot to love about the sarcastic Reaper. 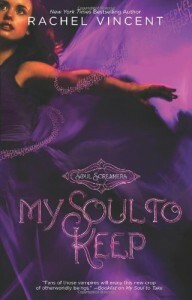 I read My Soul to Keep as part of Soul Screamers Volume 2. 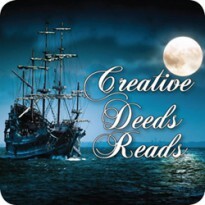 Having the 3rd and 4th books along with the Todd’s novella all in one place is a great way to read these books. The next book is My Soul to Steal. I’m still on the fence about when I’m going to pick it up. I almost continued reading as soon as I finished My Soul to Keep. I think I might just hold off until Soul Screamers Volume 3 is closer to release.